EVERETT, Wash., June 14, 2011 /PRNewswire/ -- Boeing (NYSE: BA) today delivered the first 777-300ER (extended range) to Angola flag carrier TAAG Linhas Aereas de Angola (Angola Airlines). The airplane is the first purchased, owned and operated by an African carrier. "This is a proud day for Angola and its people," said TAAG Chairman Dr. Antonio Luis Pimentel Araujo. "Taking possession of this airplane and being the first in all of Africa to buy, own and operate the airplane further confirms TAAG's commitment to leadership and innovation in African aviation." Today's delivery is the first of two airplanes ordered by TAAG in October 2009. TAAG will use the airplanes for route expansion to destinations including direct routes to Rio de Janeiro, Sao Paulo, Lisbon and Oporto. 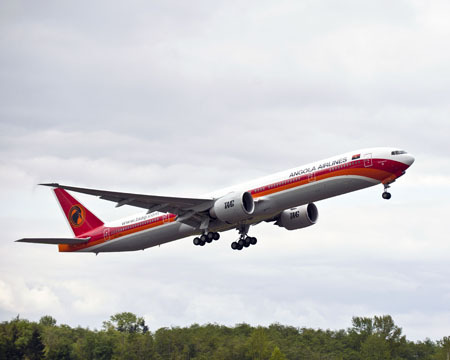 The airline is also preparing its application to fly into the United States with its new 777-300ERs. TAAG currently flies 777-200ERs from Luanda, Angola to Lisbon seven times weekly, to Beijing once a week, to Dubai twice weekly, to Sao Paulo four times a week and to Rio de Janeiro three times weekly. "Boeing's relationship with TAAG began more than 30 years ago when the first Boeing 737 arrived in Angola in 1976," said Marlin Dailey, vice president, Sales & Marketing, Boeing Commercial Airplanes. "Since that time, Boeing and TAAG have enjoyed a partnership built on continuous advancement in technology and innovation, evident in TAAG's selection of the 777-300ER. Boeing looks forward to continuing its lasting partnership and proud history with TAAG." The Boeing 777-300ER is 19 percent lighter than its closest competitor, greatly reducing its fuel requirement. It produces 22 percent less carbon dioxide per seat and costs 20 percent less to operate per seat. TAAG will configure its 777-300ERs to carry 293 passengers in a three class configuration. "The Boeing 777-300ER is recognized by airlines and passengers alike as the No. 1 choice for long-distance travel. These two 777s will help expand our premium service offerings to Europe," Dr. Araujo said.